What It’s About: When Troy McGreggor (Christian Malcolm) unwittingly discovers the key to a lost city buried in the wilds of Canada, can even boozy, be-mulleted pick-up truck driver Zap Rowsdower (Bruce J. Mitchell) help him survive? Why Watch it Today? : Today is National Flag of Canada day, which marks the day in 1965 when the red and white maple leaf first flew over Parliament Hill in Ottawa. 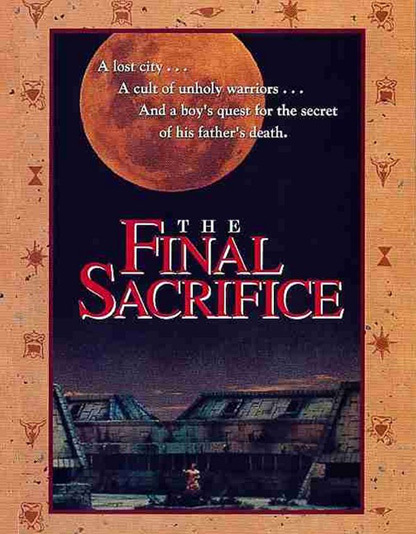 The Final Sacrifice is a cult favorite thanks to it featuring in an exceptional episode of Mystery Science Theater 3000, where its Canadian origin was much parodied. Other Choices: We featured The Saddest Music in the World in 2011 for its inclusion of the song “Red Maple Leaves” and because filmmaker Guy Maddin makes his films in Canada from his own experiences. You can also check out our Canada tag for all kinds of movies made by and set in the Great White North. This entry was posted in Adventure, Buddy Flick, Cults, Fantasy, Independent, Movie of the Day, Mystery, So-Bad-It's-Good and tagged Canada, cult leader, cultists, lost city, low-budget, mullet, pick-up, teens. I hope someday to have a similar experience showing this to my son. She is 16 now but we still watch MYST3K together.